Before I began this blog, I came up with a list of topics and recurring themes. Prior to ever posting, I had ideas for at least 60 posts, and about 5 themed topics. I even wrote out 10 of them, and was waiting to scan some cards to go with the posts. Alas, we no longer have a scanner, so I need to focus on other topics besides how my collection was amassed. Looking for an idea, low and behold, Bad Wax dumped a treasure map right in my lap. One of my recurring topics was to discuss Topps cards that were never made for sure fire HOFers. All I needed was some free imaging software, and a Google search engine, and I was set. After reading Bad Wax’s post, I now have free imaging software with somewhat understandable instructions, and I can now unleash my homemade cards on the world. Which brings me to the topic at hand, why in the world did Topps not print cards for the last seasons of baseballs greatest players? Was it really that important to have a no name nobody who scratched 50 ABs in their fifth season deserve a card, and leave out immortals like Aaron, Mays, Schmidt, etc.? It absolutely boggles my mind. So, I decided to honor all those baseball legends who ended up on the Topps cutting room floor for the likes of Enzo Hernandez. 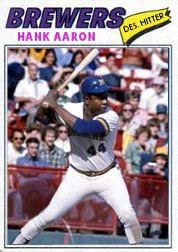 First up would be The Hammer, arguably still the reigning Home Run King. I made two versions of this card because I like both action shots I found. The DH turned out much better than I thought it would, but I’m not completely satisfied with the font type and color. Version 1 - "Aaron at the Bat"
Version 2 - "Run, Aaron, Run"
Not too shabby for a 42 year old at the twilight of his HOF career, and much more deserving of a 77 Topps card than many others from that set. EDIT: After seeing Punk Rock Paint's awesome version of the 77 Aaron card, I forgot that those cards didn't list DH, they listed DES. HITTER. So, I edited the picture to be more accurate. Also, PRP, do you remember the font style you used for your version? Mine is almost, but not quite right. Definitely the at bat one. I like this idea, and agree; Topps should have made a final card for surefire HOFers the year after they retired, so as to capture the full career of stats. As a diehard Schmidt fan, it would have made the dreadful '90 Topps set a little less painful, with a Schmidt card in it (not counting the TBTC card). 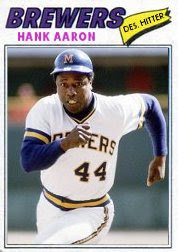 I like the running version, only because I've seen cards depicting Aaron batting hundreds of times. It's refreshing seeing him running in that uniform. I couldn't have done a better job in my own "Cards That Never Were" series. Kudos! while I like the Running Man shot, Henry needs a bat in his hand. Very nice. I like version 1 better, but both are good. Topps should do a subset or an insert set like this.